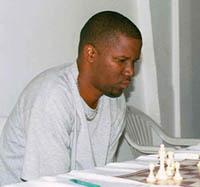 FM Grantel Gibbs, who is the current President of the Jamaica Chess Federation, holds the distinction of being the first Jamaican Player to have attained the title of Fide Master. After learning the game in 1982 he started playing chess competitively in 1986 under the encouragement of former Women's National Champion, Claire Clarke. FM Gibbs is feared by most Chess Players because of his aggressive attacking playing style, and his powerful middlegame. Most of his games rarely reach the ending, as he prefers sharp, dynamic unbalanced unclear positions where both Kings are in imminent danger and the chess contest can be decided swiftly and concretely. He prevails in positions where the stronger attacking player wins, and in terms of raw middlegame strength and attacking genius, he is perhaps rivaled only by National Masters Devlin Sinclair, Dr. Kevin Brown, Shane Matthews and former National Champion Ryan Palmer. This two time National Champion won his last national Championship in 1994 and is the current defending Masters Knockout Champion, which he won in 2001. He is matched only by the "Magician" NM Shane Matthews in blitz chess and was a former two time National Blitz champion when he won the blitz titles in 1993 and 1996. His strongest International performance occurred when he scored (5/9) in the 1999 Caribbean Open in Trinidad, in which he played Grandmasters Urday of Peru and Chris Ward from England. FM Gibbs is currently in the process of regaining the title of national Blitz Champion and most recently qualified along with NM Geoffrey Byfield in the 2nd 2002 Blitz Qualifier. He also has his sights set on winning this years National Champs, which he last won in 1994. FM Gibbs has achieved much, as a chess player and as Jamaica's first FM, does not have much more to prove. He now leads the JCF as the president and his contributions to chess in terms of administration have been tremendous. However, the recent exploits of FM Warren Elliott have inspired FM Grantel Gibbs to go back into the fray. This years National Championships will provide the platform for him to recapture the title he once had. If he can regain his form he will be one of the favourites for the title. To be the best chess player in Jamaica, you must beat the best chess players in Jamaica. Time will tell, and history will be the judge. See Jomo Pitterson-Grantel-Gibbs , Jamaica Ch, 2002.